Communicating with their student's contacts is made easy for your instructors with two ways to send emails in the Staff Portal. The ability to send an email in the Staff Portal is controlled by the Allow staff person to send emails setting on the Portal Settings tab of the instructor's Staff record. 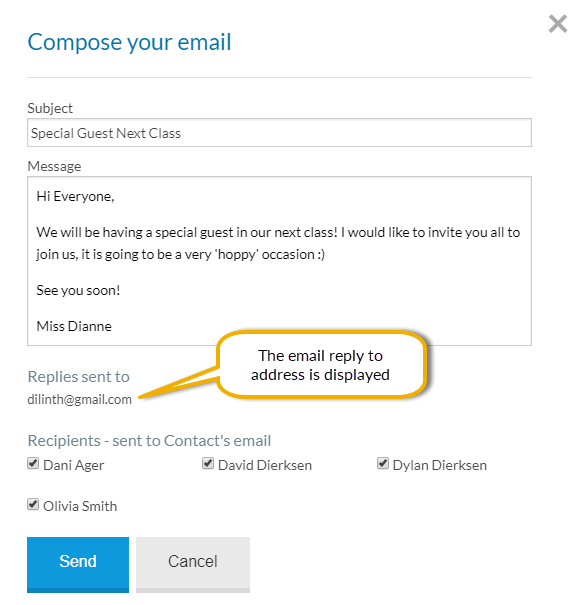 The Email button located on the Manage Classes tab is at the class level and allows the instructor to email some, or all, students in a class at one time. 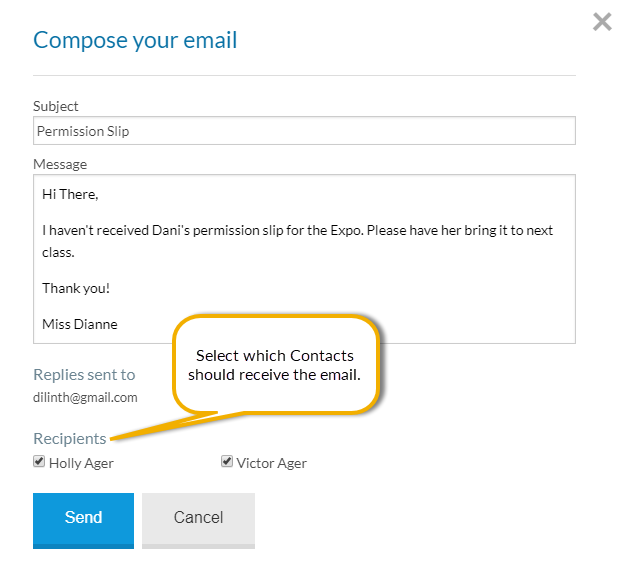 In the Compose your email window, the instructor can select which students they want to email. The email is sent to all Contacts in the Family record with a unique email address. If two contacts in the Family record have the same email address, only one copy will be sent. A history of this email is kept in the Family record on the Misc tab for 180 days from the date sent. The email can also be viewed in the Parent Portal on the News tab in the Recent Communications section. Note: Your organization does not receive a copy of the email. When on the Attendance page in the Staff Portal, an instructor can use the SEND EMAIL link to send an email to an individual student. In the Compose your email window, the instructor can select which Contacts in the Family record to send the email to. If two or more selected Contacts in the Family record have the same email address, only one copy will be sent. The reply email address for emails that your instructors send through the Staff Portal is defaulted to your Organization email address (as designated on the Edit Settings page from the Tools menu). You can opt to change this default to instead have replies sent directly to the instructor who sent the email. To change the reply email address for an instructor's Staff Portal emails, go to their Staff record. The Email replies sent to setting is located on the Portal Settings tab, in the Manage Classes Tab section.